which has been electronically translated but with some info that I could understand or guess. This will hopefully help with model identification rather than create confusion. *** NOTE The 3HX series seems to be the start of EXUP. Also, I am not sure how the 3HX relates to the FZR250 as they are only ever refered to as the 2KR or 3LN models. The FZ250 PHAZER is the base form, it appears as a race replica, with the full cowl of FZR400 design. 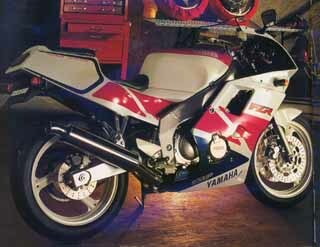 This FZR250 became explosive hit and the next year when it appears (1987) 28,000 units or more sold. In regard to this early type FZR, after some selling it is improved minutely. The improvements and the serial number which are modified are as follows. The model where the EXUP exhaust device is fitted. instead of pushing the pistons down to the bottom of the stroke. would otherwise be available making the FZR much more rideable at low rpm. to on the 6mm of step position. Summer, sponsor color version of the NESCAFE AMERICANA color and the TECH 21 color being limited and being sold. Also this model becomes the similar hit model as the first year , 20,000 units or more sells in year. improved brakes, improved handling considerably. Differences, rise of body price (4 ten thousand Yen), was the time when shrinking popularity of race replica starts appearing. travelling efficiency the cartridge (I think that means it becomes a self contained screw on type). But the sacrifice is a 6 kilogram weight increase. The 3LN3 1990 year color remain the same for the 3LN5 (1991), but the 3LN3 after the 3LN5 appearing that way being sold and continuing. becomes silver paint, note is necessary part interchangeably. swing arm, are, but it has stopped being 91 year model. You think this becomes standard of distinction of production time. also each manufacturer to become only colouring change, it was the time when replica sales becomes decisively reduced. The sale quantity of 1990 was reduced by half to 8700. They are 40 horsepower self-restriction corresponding models which are sold in February of 1993.
largest torque of 2.6kg-m, a 0.1kg-m improvment. being, with this model excessively shift change do, it reached the point where it can travel. The last model appears in March of 1994. As for this model, the color specification there is no modification with the sufficient model which modifies. As for Yamaha, it is regrettable not to produce the super sport model in 4 stroke 250cc classes the after the this.